The Canon EOS 7D was, at its introduction, without question, the best APS-C sensor-sized DSLR Canon had ever produced. While that camera remains a strong contender even today, 5 years after its introduction, the Canon EOS 7D Mark II is a huge upgrade from this model. At a summary level: Stuff a Canon EOS-1D X into a 7D-sized APS-C body with an APS-C-sized sensor, add a few enhancements (and remove a few), cut the price by 74% (as of review time) and you get a 7D Mark II. This camera is a bargain-priced, professional-duty-ready DSLR waiting to tackle your world. The 7D was the first model in what is now a series of cameras. Under Canon's current EOS camera model naming scheme, the number of digits in front of the "D" provides the first clue to where the camera fits into Canon's lineup. The fewer digits present in front of the D, the higher the camera line. 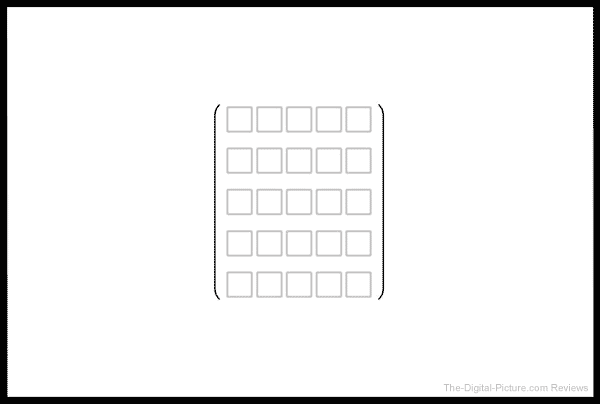 Once a single numeric digit is reached, the lower the number, the higher-end the camera is in the lineup (this is reversed for the **D, ***D, ****D and Rebel lines). The ranking gets less clear between the 6D and the 7D lines (the 6D is a full frame model, but the 7D is more feature-filled), but Canon's current 1D-Series model remains the best camera available. Single numeric digit camera models are given a "Mark" roman numeral when upgraded. So in the case of the 7D II, we have a second-edition single digit line (the best), but with a higher number within the single digit lineup. While Canon’s naming scheme places the 7D II just below the 6D in the higher-end camera lineup, you’ll notice that the naming scheme doesn’t tell the whole story – in many instances, the 7D Mark II’s feature set makes it the clear winner over its full-frame cousin. The original 7D was in Canon's lineup longer than any other EOS camera before being upgraded and the 70D had most of the 7D's features along with some significant new ones (including Dual Pixel CMOS AF) at a lower price point, bringing Canon's product segmentation into question. The 7D II solidly clears up that issue. The 7D II is today at least what the 7D was when it was introduced: "... the ultimate step-up camera for serious photographers or a second camera for professionals in the field." [Canon] While it may be a second camera for many professionals, the feature-to-price ratio of this camera is going to make it the first choice camera for many professionals. As is frequently the case with a new camera model, never-before-seen features are introduced with the 7D II. 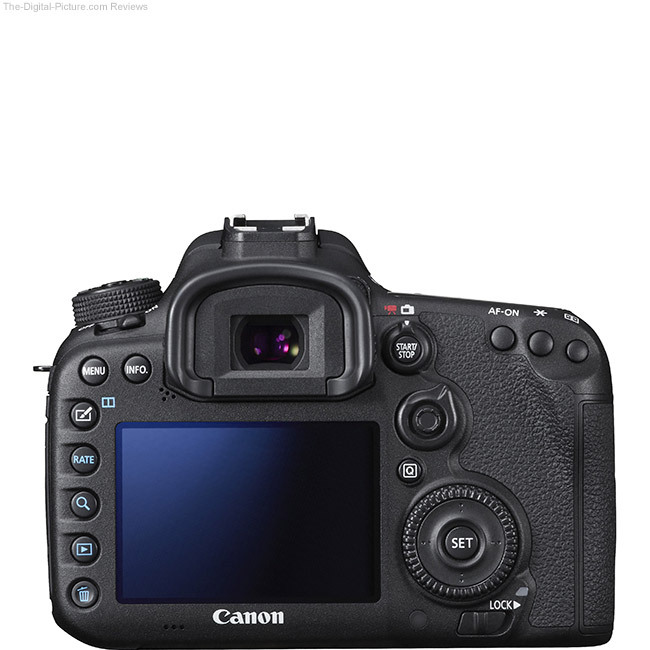 View the full Canon EOS 7D Mark II specifications to compare additional cameras. 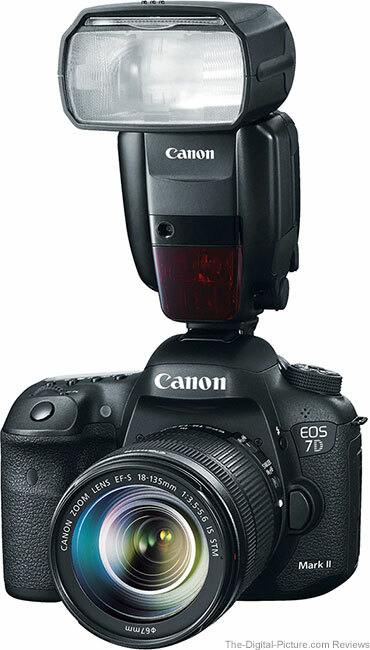 With the highest density DSLR sensors available, the EOS 7D II along with the 70D lead the Canon pack for "reach". When you are lens focal length limited, a more-dense sensor can deliver more resolution in your final crop (bird photographer alert). Of course, the considerably-smaller-than-full-frame APS-C format sensor gives your lenses a narrower angle of view, making them appear to have a 1.6x longer focal length than the numbers printed on them (also welcomed by bird photographers). That shorter focal length lenses are generally less expensive, smaller, lighter and possibly available with a wider aperture is welcomed by all. With the 7D Mark II in the lab and tested on our enhanced ISO 12233 chart, we see that the 7D Mark II is equivalent to the 70D in image quality and sharpness and that the 7D II shows higher resolution and increased sharpness in the 7D Mark II vs. 7D comparison. There are no surprises here. More surprising is the 7D Mark II's high ISO noise performance. I have created an extensive image quality comparison between the 7D Mark II and many other Canon EOS DSLR Cameras, but because of the large bandwidth requirements to load these images in their entirety, the comparison is hosted on a page separate from the review. Click on the color block image below to open this comparison in a new browser tab. Simply close the tab to return here. If you followed the link and read the commentary on the image quality comparison page, jump down to the File Size and Media section as much of the following will be repetitive. Prior to the arrival of the Canon EOS 7D Mark II, the EOS 70D was the image quality leader of Canon's APS-C format cameras. The 7D II arrived not too long after the 70D landed in the warehouses. As already mentioned, the 7D II shares the 70D's resolution and, with the current rate of image quality improvement combined with the fact that no image quality improvement claims were capitalized on in the 7D II press release and other marketing materials, I predicted that the 7D II's image quality would be at least as good as the 70D but not significantly better. The 7D II vs. 70D image quality comparison was the first I wanted to make as this would set the bar for the rest of the comparisons able to be made. At ISO 800 and 1600, the difference, while still not huge, is more easily recognized. The 7D II's advantage grows stronger at ISO 3200 and 6400. I have typically avoided these ISO settings on prior APS-C models, but I'm pleased to see ISO 3200 looking this good. At ISO 12800, I can almost read the numbers on the test chart ruler. As you probably expected to hear at this point, improvements are also seen at ISO 25600. Going where no Canon APS-C DSLR has gone before, the Canon EOS 7D Mark II brings us the found-only-in-full-frame-models-until-now ISO 51200 setting. It is no surprise to me is that ISO 51200 produces a very ugly image with noise overpowering image detail and color. Perhaps ISO 51200 will be useful for nighttime surveillance and law enforcement, but I think that Canon marketing will make the most use of this bragging-rights setting. 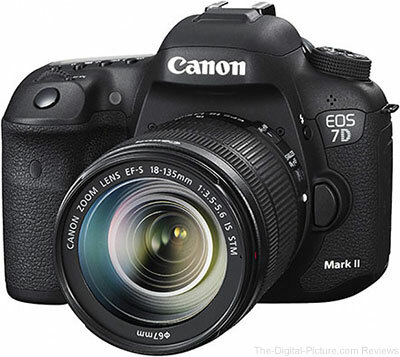 A comparison that I am sure is on many people's minds is the 7D Mark II vs. 7D comparison. When comparing the 7D Mark II to the 5 year older original 7D, we must keep in mind that Canon has turned the in-camera sharpness level up a notch (equivalent to about a +1 "sharpness" increase). This practice started with the T4i and has been followed with all APS-C bodies released since (including the T5i, 70D and EOS M). The 7D Mark II is now included among the increased default sharpness models. I think that this is a positive change. I found the original 7D images to be somewhat soft without increasing sharpness slightly higher than I normally do, so I think Canon made the right decision here. I looked at the 7D II's image quality from many other angles. The results of some of these tests are included on the comparison page. The "w/ USM" samples were processed using the default Unsharp Mask sharpness settings in DPP's Standard Picture Style. When these examples are compared with the test's standard processing examples, a significant difference in sharpness is seen. The reason why I do not use the standard sharpening most of the time is also seen. The color blocks should not have halos around them. One positive aspect of the USM sharpening is that the sharper results do not show increased noise levels. Another set of samples show images processed in the Neutral Picture Style with a sharpness setting of "1". I use the Neutral PS in-camera because it applies a lower contrast tone curve to images, providing a better picture of the camera's available dynamic range on the histogram shown on the LCD. These results appear more dull/less exciting. There is a time and place for the use of this setting, but I usually change my RAW images to the Standard PS immediately after importing them. In the comparison, four sets of noise reduction samples are provided. As always: in-camera noise reduction is available (the 7D II offers 3 levels) and noise reduction is available during post processing (with far greater control). The Multi-shot Noise Reduction (MSNR) is another in-camera option. The first noise reduction sample set was captured in RAW format using the standard noise reduction level set in camera (high and low settings are also available). The standard setting is the default out-of-the-box setting for this and many other Canon DSLRs. The "w/DPP NR" set allowed DPP to apply a default amount of noise reduction to the RAW images captured with NR turned off in-camera. These settings were slightly different than the settings that the standard NR in-camera generated. That DPP applies noise reduction to images captured with noise reduction turned off in camera appears to be either a bug in the software or an attempt to protect me from myself. To avoid this problem, I instruct DPP to set noise reduction levels to 0 for all images via the preferences. The third row of noise reduction results, "JPG w/ STD NR", shows images with standard noise reduction being applied to the in-camera created JPG images. The first three rows of noise reduction results show slightly different amounts of noise, but I don't see a compelling reason to use in-camera noise reduction over post-processing-added noise reduction aside from perhaps a small amount of time savings. The fourth row results, captured using Multi-Shot Noise Reduction, shows a marked improvement in noise levels. MSNR merges information from multiple (four) exposures taken in a full-frame-rate burst into a reduced noise image. The concept makes a lot of sense. I see at least 1 stop of improvement and, at the higher ISO settings, I see closer to two stops of improvement over conventional noise reduction. The second set of test results on the image quality/noise comparison page utilizes a fabric subject. The fine details in the fabric better-hide high ISO noise and favor larger and higher resolution sensors. I don't see many surprises from the fabric results after reviewing the color block set, but ... I continue to be impressed with the 7D II's improvements over prior Canon APS-C bodies. The 7D II shows off its noticeably higher resolution against the 7D and shows some high ISO noise level improvements. Though very similar to the 70D at ISO 100, the 7D II shows progressively cleaner results as ISO settings are increased. It remains unlikely that I will use the ultra-high ISO settings for any serious purposes. The size of the files generated by the 7D II are very similar to those from the resolution-matching 70D. The following table shows comparative RAW file sizes for a photo of a standard in-studio setup with a moderately-high amount of detail taken with the referenced Canon EOS DSLR body. The EOS 7D II benefits from dual memory card slots – a first for Canon's APS-C sensor cameras. Image files can be written to a CompactFlash (UDMA Mode 7) memory card and/or a SD/SDHC/SDXC (UHS-I) memory card. Files can be written to both cards simultaneously (for redundancy) or sequentially (for increased capacity). Don't downplay the increased capacity option. This camera can create a huge number of images in a very short timeframe – you might be filling a pair of high capacity cards in a short time span. A CF card with a 30 MB/sec. or faster write speed is recommended for full functionality including ALL-I movie recording. An SD card with a 20 MB/sec. or faster write speed is recommended. 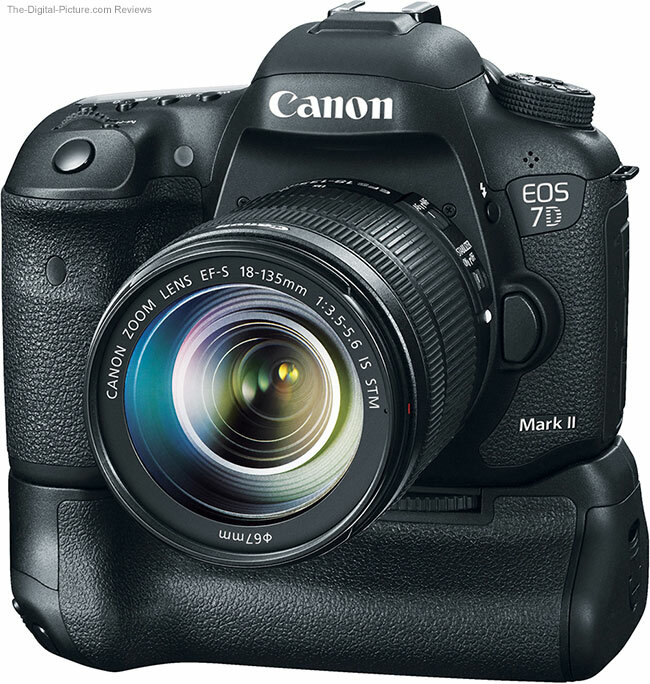 With a "newly developed mirror mechanism [that] uses motorized control to help reduce impact and enhance camera performance during high-speed continuous shooting" [Canon], the Canon EOS 7D Mark II can capture images at a rate that was not-long-ago max for the top-of-the-line EOS 1-Series DSLRs: 10 frames per second (approx. 9.5 fps when iTR AF is operating and other conditions can affect the max frame rate). With this fast frame rate combined with a 130 JPG or 31 RAW file buffer, the 7D II can capture the perfect moment of your action. If capturing a subject in motion, shutter lag matters to you. You want the camera to respond very quickly to your shutter release press, enabling your shots to be perfectly timed. Canon has been shortening the lag time in their non-1-Series bodies and now the 7D II spec matches the normal shutter lag of the high-end 1-Series cameras. Compare the specs of the Canon EOS 7D II to the very impressive 1D IV for example. The 7D II is very responsive and ready for your fast action from a frame rate perspective. Canon's DSLRs historically have tested very close to their specified frame rates, and with a fast memory card, often exceed the specified buffer capacities. To test the Canon EOS 7D Mark II's 10 fps drive mode and 31 RAW file buffer specs, I configured the camera to use ISO 100, a 1/8000 shutter speed (no waiting for the shutter operation), a wide open aperture (no time lost due to aperture blades closing) and manual focus was selected. The lens cap remained on (insuring a black file) and a freshly-formatted fast memory card was loaded. Using a Sony 32GB Class 10 UHS-I (SF32UX) SDHC Card (Max. Read/Write Speed: 94/45 MB/s), the 7D II captured 30 frames in 2.9 seconds to match the rated drive speed and come within 1 frame of the rated buffer depth. After .3 seconds, two additional frames were captured .27 seconds apart and then a repeating pattern of two similarly spaced frames were captured every .5 seconds. Put a Lexar 64GB Professional 1066x UDMA 7 Compact Flash Card (Max. Read/Write Speed: 160/155 MB/s) in the slot and the 7D II captured between 46 and 49 frames in 4.7 seconds (or less) to again match the rated speed but far exceed the rated buffer depth. With this Lexar card installed, two additional frames were captured .1 second apart every .2 seconds for a post-buffer-filled performance of 14 frames in 2.27 seconds or about 5.7 fps. This rate is faster than some cameras shoot with an empty buffer and I'm guessing that this rate continues until the card is filled. Shoot in JPG format and this card and camera combo can shoot at 10 fps for a very long period of time. These frame rates should be considered best-possible for the referenced cards and your in-the-field results will likely vary, but a fast memory card definitely makes a difference with this camera. Note that there are faster SD cards available than the Sony I tested with and that I'm not saying that CF cards are faster than SD cards in general, but the speed of the card does matter. A (usually minor) concern that I have for using CompactFlash cards in this camera is the ease in which an improperly-oriented card can be inserted into this camera (more easily than a 5D III for example). The concern is due to the potential damage that can be caused by an improperly inserted CF card. Live view shooting can also be used to further minimalize the 7D II's audibility. Perhaps even more beneficial for understanding what can be done with this frame rate is to look at a visual example. Drag your mouse over the labels under the following image for a visual look at the 10 fps rate. Drag your mouse completely across all of the labels in 1.3 seconds to get an idea of the speed of the approaching American Quarter Horse – approximately 35 mph (56 kph) based on previous GPS testing. I know, the labels are a bit small for that mouse move, but this approach happened very fast. As with action capture of many subjects, there are specific positions of the horse that I like best. My favorite is all four hooves off of the ground at the same time to leave no question about the speed of the horse. That horse position is best-timed with the horse and rider nearly filling the frame. Even at 10 fps, I do not have many captures of the ideal pose in this entire burst example. True, I have the opportunity to shoot this particular approach over and over again, meaning that I might be able to get the same image with a 5 fps camera if twice as many passes were made. But, not all subjects give you a second chance (sports and wildlife are two such examples). Also, it takes twice as much time to shoot two passes and time is a precious resource for all of us. Here is another example showing wing positions captured in a 10 fps burst. 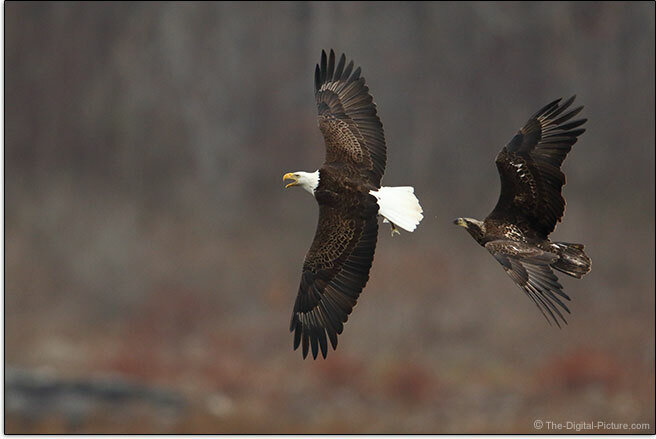 Shown is a juvenile bald eagle chasing an adult (the adult has a fish in its talons). Certain wings positions are more photogenic than others and in this case, there are roughly 2 frames per wingbeat in which to capture the ideal positions. A 20 fps rate would not be too fast for this use. A 10 fps rate is twice as likely to capture ideally positioned subjects than a 5 fps rate. Of critical importance for most photographers, and especially for sports/action and wildlife photographers, is autofocus accuracy. A camera's image quality doesn't matter if the subject is out of focus. The first 7D received what Canon at that time called "... the most advanced AF system ever seen in an EOS SLR." While that 19 cross-type AF point system was groundbreaking, the 7D II breaks a lot of new ground. The 7D II receives the 1D X's AI Servo AF III along with an enhanced version of the EOS 1D X's EOS iTR (Intelligent Tracking and Recognition) AF system, featuring viewfinder-based face and color detection along with a newly-developed wide-area 65-cross-type-point AF system. Cross-type points are sensitive to lines of contrast in two directions instead of just one – for potentially significantly better focusing performance. The 1D X and 5D III both have nearly as many AF points as the 7D II (61), but at most, only 41 of their AF points function as cross-type points. The 7D II's center AF point has dual cross-type functionality with an f/2.8 or wider aperture lens. As with the 1D X and 5D III cameras, the 7D II's AF Configuration Menu permits configuration of the AF system's tracking sensitivity, acceleration/deceleration tracking, and AF point auto switching. An AF first for a Canon APS-C DSLR is that, like the 5D III and 1-Series bodies to date, the 7D II will autofocus with lens and extender combinations with max apertures as narrow as f/8. In this case, only the center AF point acts as a cross-type point and only the four neighboring AF points function in addition. 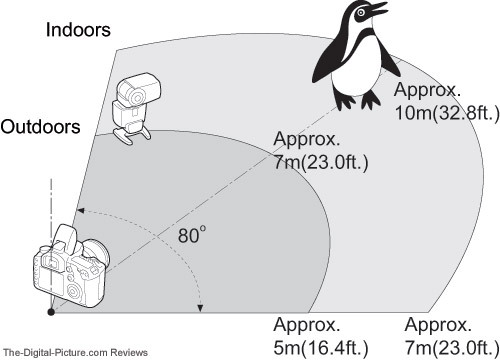 Those pursuing bird and wildlife photography, two of the most common uses for extenders, will especially appreciate this feature. Another eye-catching spec is the 7D II center AF point's low light performance. Only the EOS 6D matches this camera's -3 EV center AF point spec. The EOS 7D Mark II’s AF Area options are Single-point AF, Spot AF (reduced size single point), AF Point Expansion w/ 4 points (single point plus 4 surrounding points in "+" configuration), AF Point Expansion w/ 8 points (single point plus all 8 surrounding points), Zone AF (one of 9 preconfigured zones), Wide Zone AF (new – a large group of center, left, or right AF points) and Auto AF point selection (all 65 AF points active). These options are illustrated below. The horse gallops toward the camera – fast. I want the rider to be in focus, but the horse's ears and mane strongly compete for the top AF point's attention as the animal quickly moves up and down. The shallow depth of field does not allow both to be in reasonable focus at the same time. Having an AF point so close to the border of the frame allows me to (better) avoid the AF point's attention moving from the rider to the horse. Good examples of situations requiring a wide-positioned AF point include any sports that involve running (track, baseball, soccer, football, field hockey, etc.). When a person is running fast, they lean forward and the head leads the lean. If the subject's eyes are not in focus, the shot is likely a throw-away. To keep the runner's eyes in focus requires an AF point placed on them and at the oft-desired near-frame-filling distances, an AF point positioned close to the frame edge is required. The 7D II has you covered here. Cameras with a lower percentage of the viewfinder covered by AF points require similar subjects to be captured from a longer distance and/or with a wider focal length, meaning cropping is required to achieve the same desired frame-filling result. Cropping of course reduces final image resolution. The Canon EOS 7D Mark II's wide area AF system has you covered in these situations, allowing you to fully utilize its 20.2 MP sensor. There is little remaining need to focus and recompose and in-motion subjects are more easily captured in their final-cropped framing – this capability is a big deal. I created a white canvas in Photoshop and then created two vertical bars spaced to fall under the rightmost AF point and the next point to the left. The camera is unable to focus on the white canvas (no contrast available), but can easily lock focus onto the black bars. I then reduced the opacity of the right bar until the stronger-contrasting bar under the adjacent focus point took over the camera's attention. The 7D II was tripod-mounted and positioned at an angle to the display to better discern the camera's selected point of focus. 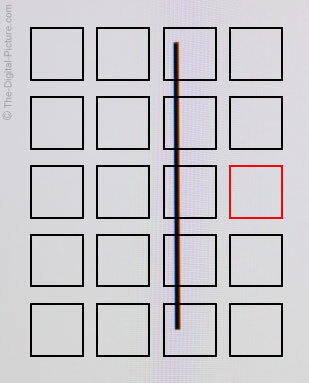 Shown in the examples is a screen capture from DPP showing the selected AF point and the area where the LCD display's pixels are most in-focus. The bar under the right-most AF point is still visible in the "Low Contrast" example, but the camera focuses similarly on the strongly contrasting bar to the left. Corner AF points (including the corner points in the slightly enlarged center section of AF points) utilize contrast information under the two adjacent points. Whether the outer AF points are simply larger than the point indicator or the adjacent AF point is actually being used, I cannot say. Whether this feature is beneficial or problematic is dependent on the situation you are shooting in. It was somewhat problematic in the horse example I've been showing as the bouncing ears and mane did get the 7D II's attention sometimes. The 5D Mark III's AF system does not exhibit this behavior, but the 5D III's outer AF points are farther from the borders than even some of the 7D II's next-to-outer AF points. I should also note that I could have adjusted the 7D II's AF tracking parameters to ignore the temporary interference of the ears (the default tracking settings were in use). When the 7D Mark II was announced, the big question on my mind has been "How does the 7D Mark II AF system compare to the best-ever-prior AF system found in the 1D X and 5D Mark III?" The 1D X and 5D Mark III AF systems are easily the best I've ever used and my in-focus hit rate when using these cameras, especially with subjects in motion, has never been higher. Then the 7D Mark II was announced with even more focus points (including a higher number of cross-type AF points) and many of the same or even improved AF features found in the 1D X/5D Mark III. I found the 70D to be Canon's best-focusing APS-C format DSLR prior to the 7D II's release and based on initially available information, expected the 7D II to easily surpass this competence. When design meets reality is of course the real test and I've been paying very close attention to 7D Mark II auto focus performance. It is easy to measure and compare image quality, but autofocus performance and especially AI Servo AF performance is very difficult to evaluate. Multiply the infinite combination of lighting (amount, size and spectrum) and subjects (color, contrast, size, shape, speed and direction) possible by the wide range of configurable AF settings and it becomes clear that exhaustive testing of AF performance is simply not a realistic endeavor. Predicting the point of perfect focus on a fast-moving subject at the precise moment the shutter opens in AI Servo AF mode is one of the biggest challenges for AF technology and AI Servo AF accuracy testing is one of the most-difficult camera tests to perform. Shooting a challenging scenario that is familiar to me is the best method I've found to at least get a baseline comparison and having one of the kids gallop their horses straight at me is one of the best baseline tests I've found. 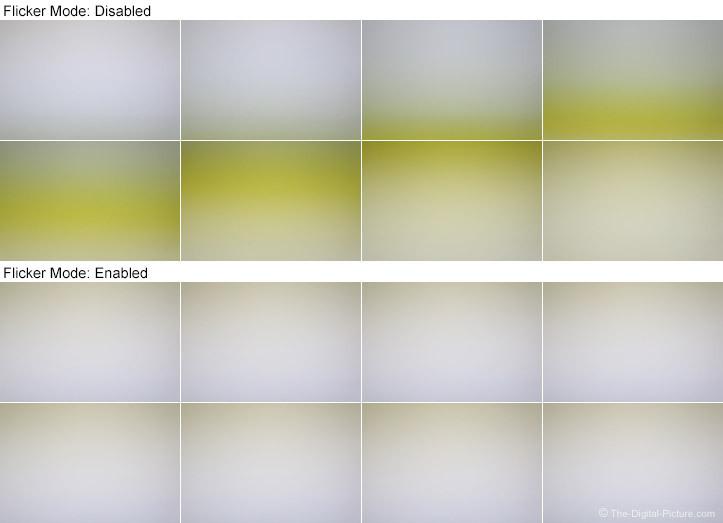 The 10 fps example shown earlier in the review is an example from the 1,500-or-so images captured on two different days under different lighting conditions (full clouds and direct sunlight). 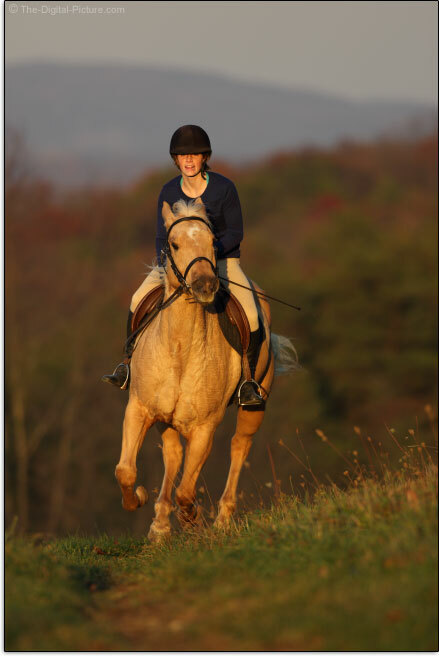 In the galloping horse shoots, the 7D II performed extremely well. This camera, behind a fast-focusing Canon EF 300mm f/2.8L IS II USM Lens, had no trouble keeping up with the horses down to close distances. As I already mentioned, the camera liked to focus on the horse's mane instead of the rider on occasion, but that the 7D II's AF could switch between the two at such a fast rate (between frames) shows the camera's incredible AF speed. Otherwise, the 7D II appears to stay focused on this challenging subject as well as the 1D X and 5D III. And again, I could have adjusted the tracking parameters to avoid this issue completely. A few indoor soccer matches and a running event were included in my 7D II AI Servo action testing with good results observed. The soccer matches were under terrible lighting conditions with strong light flicker and the AF hit rate was decent. The running event was outdoors and AF tracking performance was excellent. 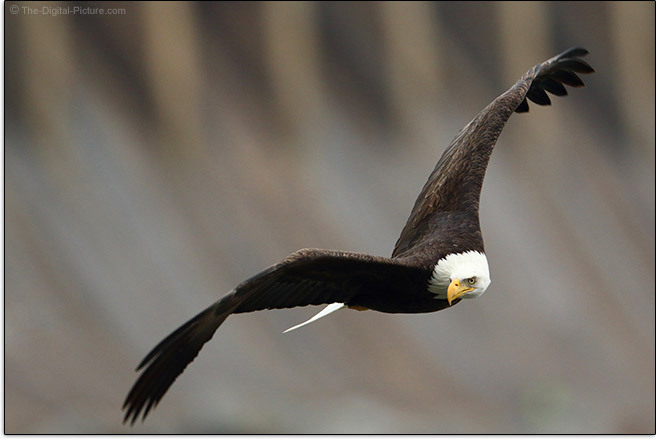 "How well does the Canon EOS 7D Mark II perform when shooting birds in flight?" has quickly become a frequently asked question. The Canon EOS 7D Mark II, especially because of its high performance AF system, high density imaging sensor, fast frame rate and modest-for-what-you-get price, is quickly finding favor with bird photographers. And, one of the biggest challenges faced by bird photographers is maintaining focus on birds in flight. Thus, the question is getting asked. 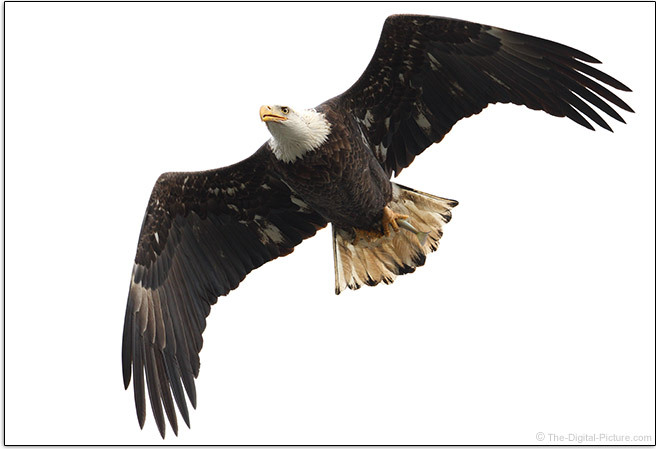 I had the privilege of spending the larger part of a day shooting bald eagles below the Conowingo Dam in northern Maryland with the 7D II this week. My goal was to discern how well this AF system could track the often-erratic movement of these beautiful birds in flight (and to hopefully come away with some nice images). The day's moderate-to-heavy cloud cover eliminated any harsh shadow issues, but made the sky a white canvas (white sky is OK, but is not my favorite) and provided low light to further challenge the AF system. The bottom line is that I'm really impressed with my success rate from this day. I was using the Canon EF 600mm f/4L IS II USM Lens with and without a Canon EF 1.4x III Extender behind it. Tracking these fast and erratic-moving birds with such a narrow angle of view was quite challenging, but when I kept the selected center AF point or one of the 4 neighboring AF points (based on the AF area I was using) on or even close to the bird I was tracking, most of the images were properly focused. Especially impressive was the ability of this camera to maintain focus on the birds even with backgrounds that the birds visually blended into and even more impressive was this camera's ability to maintain focus on the birds even with high contrasting backgrounds including electrical line towers and bare tree branches against a bright sky. I was using the AF Case 2 to instruct the camera to be slow to leave a tracked subject due to obstacles. After catching its dinner, this eagle in the above picture flew directly toward the camera. I began tracking and shooting at 10 fps. I have numerous good images of this eagle, but this was the most-frame-filling that did not cut off any significant amount of the bird. This image is essentially right out of the camera. I extended the canvas slightly to the bottom, added the extreme tip of the two bottom-most feathers and removed imperfections from a couple of other feathers. I changed the Picture Style to Standard (in DPP), changed saturation to "1", white balance to "Cloudy" and added a touch of noise reduction. This camera is a great choice for bird photography. The consensus that I'm hearing from the other photographers frequenting Conowingo Dam is that their 7D Mark II experiences mirror my own. I expected to have no problems with the 7D II's One Shot AF mode – I rarely do with any Canon EOS DSLR cameras – and my expectations have proven true. Simply place your selected AF point on a point of adequate contrast on your subject and the camera very quickly gets the job done. One shot AF works very well even under very low light levels. From a dimly lit room, looking through a slightly cracked door into a very dark basement, the 7D II was able to auto focus on the edge of a barely-visible reflection using the center AF point when the camera's meter was selecting a 30 second exposure at f/2.8. This is a very impressive capability and event photographers shooting in cave-like venues will especially appreciate this feature. Another AF feature I'm impressed with is EOS iTR AF (Intelligent Tracking and Recognition). Using color along with face recognition technology to help track subjects within the selected AF Area while in AI Servo AF mode, iTR definitely makes a difference when trying to track specific subjects including people's faces, yellow tennis balls and other subjects. Perhaps the biggest downside to enabling iTR is a possibly slightly reduced max frame rate. The iTR technology is not available in Live View mode (the raised mirror blacks the iTR sensor in the viewfinder), but Live View has its own face tracking technology that also works very well. The bottom line is that I have to declare the 70D (and 7D) dethroned as king of APS-C AF. The Canon 7D Mark II is now the best-focusing APS-C DSLR available (as of review time). The 7D II is more-directly competing with the extraordinary AF system found in the 1D X and 5D III. I'm not ready to declare the 7D II better than the 1D X and 5D III for AF performance, but I have spent a lot more time with these two bodies and there are some differences (as Chuck pointed out) between these AF systems with both sides having advantages. In use, I'm not seeing a big difference in accuracy. Conventional DSLR phase detection AF relies on light passing through the semi-transparent main mirror and reflecting from a sub-mirror into the AF sensor below. 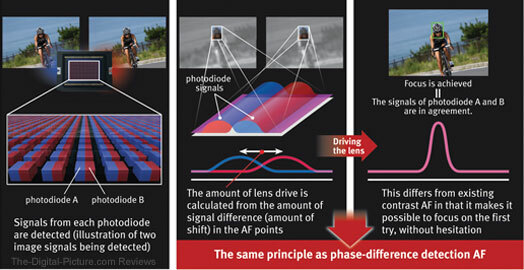 The AF sensor, in connection with the dual DIGIC 6 processors (the most processing power ever in a Canon DSLR), performs phase detection AF with incredible speed. The extremely fast and very accurate phase detection AF system has been reason alone to select a DSLR over any another type of camera. When the mirror is raised for Live View shooting or Movie mode, the primary phase-detection AF system becomes unavailable. Typical for recent DSLR models is that sensor-based contrast-detection AF then becomes available and that sensor-based contrast AF has been painfully slow. 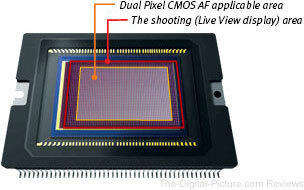 Groundbreaking with the recent introduction of the EOS 70D was Canon's innovative Dual Pixel CMOS AF (DAF) system. Each pixel on an imaging sensor in a DAF implementation is dual purposed with phase detection AF being the secondary purpose. Since the imaging sensor pixels are able to perform both imaging and fast phase-detection focus measurement simultaneously, continuous AI Servo-like AF is available in Movie mode. Canon calls this feature "Movie Servo AF". 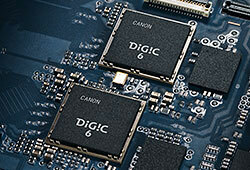 Click on the above image to learn more about Canon's Dual Pixel CMOS AF. There is likely an issue with the CPU capability in these lenses, preventing them from being fully compatible with the Dual Pixel CMOS technology. The more-conventional Live View contrast detection AF method will likely be reverted to with one of these lenses mounted. I do not currently have any of the listed lenses (though, again, that 1200 L is always calling me), so I've done no testing in this regard. Another compatibility issue that you need to be aware of is that the Movie Servo AF Speed (focus transition) feature is enabled only for STM lenses USM lenses marketed in 2009 or later (and only in FlexiZoneAF). STM lenses are also strongly-advantaged in Movie Servo AF focusing smoothness and quietness concerns. With a Canon EF 24-70mm f/2.8L II USM Lens mounted, Movie Servo AF steps are made in somewhat-disturbing-to-watch quick jumps with very-audible-to-the-camera-mic clicking/clunking occurring during focus changes. The STM lenses silently and very smoothly adjust focus in your choice of speed for ideal cinematic transitions from one subject to another. Note that an exception is that the EF 40mm f/2.8 STM’s focusing sound could be picked up by the in-camera mic during very large transitions (min focus distance to max), especially if the camera was set to something other than a slow transition (meaning the AF motor was working as fast as it could for a long duration of time). However, relatively speaking, the sound was minimal compared to non-STM lenses. My own kit has been light on STM lenses because I am generally favoring higher grade models, but having a set of STM lenses makes a lot of sense if recording video while making use of Movie Servo AF. Prior to Movie Servo AF and STM lenses, nearly all DSLR video was recorded using manual focus. Cinema-grade video generally involved careful focus pulling that typically utilized follow focus accessories. Not all video will be recorded using Movie Servo AF, but this feature – along with the built-in image stabilization found in many of these lenses – greatly simplifies quality video capture. Especially because the focus changes are so smooth and pleasing, impressive DSLR video is now much easier to capture by the masses. The 7D II's sensor-based AF includes benefits over conventional phase-detection AF. First, the AF coverage area encompasses a full 80% of the frame (measured horizontally and vertically) with no limit on a "number" of focus points to select from or include in auto AF. Second, no AF Micro Adjustment calibration is needed because the actual imaging sensor is being used for AF. And, AF can function with camera and lens combinations having an f/11 or wider aperture (vs. f/8 with the 7D II's conventional center AF point) – again, using 80% of the frame. Live View AF modes include Face Tracking, Flexizone - Multi, Flexizone - Single and Quick mode. Canon's EOS cameras are very effective at locating a subject's face and tracking that person around the frame in Face Tracking mode. FlexiZone-Multi allows one of 9 zones for auto AF to work within – similar to Zone AF mode. FlexiZone-Single allows selection of one AF point – similar to One Shot AF mode. The remaining Live View AF mode is also the oldest – Quick mode. Quick mode closes the mirror temporarily to allow conventional phase detection AF to do its job. For obvious reasons, Quick mode is the only option not allowing selection of the continuous focusing Live View menu option. As I found with the EOS 70D, the EOS 7D Mark II's Dual Pixel CMOS AF is very fast – not so far from the speed of conventional phase detection AF. As I have already begun discussing the 7D II's video capabilities, I'll dive deeper into this feature. Incredible video quality for a low price has become standard with Canon DSLR cameras. But, the primitive AF performance in movie mode (if the camera even has AF in video mode – only recent ones do) has been a barrier to enjoyment of this feature for many. What I saw with the 70D was that, while still not as high performing as the DSLR's conventional phase detection predictive AF, Dual Pixel CMOS AF is capable of tracking anything short of high speed action. DAF made DSLR video capture as easy as with a consumer grade camcorder with far superior video quality. As expected, the 7D II performs at least as well as the 70D. Note that Movie Servo AF is not available when recording 1080p at 60 fps. The typical .MOV file format (H.264, Linear PCM Audio) is now joined by a .MP4 option (H.264, AAC Audio) that is compatible with a much larger range of playback systems. IPB (Bi-directional compression) or ALL-I (Intra-coded Frame) compression methods are selectable. IPB offers a higher compression rate by compressing multiple frames together while ALL-I compresses each frame individually – allowing for more precise editing. ALL-I compressed footage will be about three times larger than IPB compressed footage, but ALL-I requires less computing power. IPB Light (vs. Standard) is selectable when .MP4 is the recording format. The mini HDMI port can be used to record uncompressed Full HD video (4:2:2) to external recorders. Video exposure control is via Program AE or fully Manual exposure. ISO settings of Auto and 100 through 25600 are available (the expanded ISO range is not available in video mode) as well as ±5 stops of exposure compensation in 1/3 or 1/2-stop increments. Audio recording options are the internal microphone capturing stereo sound or the 3.5mm stereo input jack. Manual audio level control is available (64 steps) as is a wind filter/attenuator. The 7D II has a headphone jack for monitoring recorded audio. Both chromatic aberration and peripheral illumination correction are available in 7D II video as well as the new distortion correction. The correction features require a supported lens, but most recent Canon lenses are on the compatibility list. If you can leave the camcorder at home, this camera will save a significant amount of bulk/size/weight and more easily justifies the DSLR camera purchase in the first place. New with the original Canon EOS 7D was a 63-zone iFCL (Intelligent Focus, Color, Luminance) Metering System that took focus, color and illumination into account when establishing the proper exposure. The 7D Mark II receives a substantial upgrade to this system, with an "improved EOS Scene Detection system [that] features a new 150,000-pixel RGB+IR 252-zone metering sensor for enhanced precision" [Canon], surpassing even the EOS 1D X's approximately 100,000 pixel RGB metering system. In addition, the 7D II metering system has not-seen-before infra-red and, especially intriguing to me, flickering light sensitivity. If you have ever photographed under flickering lights, such as the sodium vapor lamps especially common at sporting venues, you know what a problem that type of lighting can cause. One image is bright and the next is significantly underexposed with a completely different color cast. The bigger problem occurs when using fast/short action-stopping shutter speeds under these lights. In the top half of the following example are 8 consecutive frames captured in 10 fps burst with a 1/1000 second shutter speed. The subject is a white wall and the lights are fluorescent tubes (I had to go all the way to my basement to find these two sets of four 4' fluorescent tube lights). All images were identically custom white balanced from the center of an optimally-timed image. What you see is the frame capture frequency synching with the light flicker's frequency to cause a different result in almost every frame. The killer problem for post processing is that the entire frame is not evenly affected. Correcting this issue is a post processing nightmare. The cause of this problem is that, at fast/short shutter speeds, the flicker happens while the shutter curtain is not fully open. Because the shutter opens and closes only in the up and down directions (with camera horizontally oriented), the area affected runs through the frame in the long direction regardless of the camera's orientation during capture. When the flicker-effected area is fully contained within the frame, the amount of area affected is narrower at faster shutter speeds and wider with longer shutter speeds. At significantly longer shutter speeds, the effect from the flickering lights is better averaged in the exposures. At 1/25 second, a reference image I captured during the same test looks very nice. In this light flicker test, I shot at 1/500, 1/1000 (as shown) and 1/2000 seconds. The 1/500 second test showed approximately 2/3 of the frame severely affected at most, but the 10 frames captured around the most-effected frame had various amounts of one frame edge strongly affected. As you would expect, the 1/2000 second test showed an even narrower band of the flicker's effect running through the image (a smaller slit of fast-moving shutter opening being used), but ... I'm guessing that there are not many venues with flickering-type lighting strong enough to allow use of this shutter speed at a reasonable ISO setting. The 1/500 and 1/1000 settings are more real world settings. The bottom set of results show off the Canon EOS 7D Mark II's awesome new Anti-flicker mode. The only difference in the capture of the second set of images was that Anti-flicker mode was enabled. These were a random selection of 8 consecutive frames, but the results from all Anti-flicker mode enabled frames were identical regardless of shutter speed tested. I'm not going to say that these results are perfectly-evenly lit, but ... they are dramatically better than the normal captures and you will not see the less-than-perfectly-even lighting in most real world photos without a solid, light-colored background running through the frame. When enabled (the default is disabled), Flicker Mode adjusts the shutter release timing very slightly so that the dim cycle of the lighting is avoided. In single shot mode, the shutter release lag time is matched to the light flicker cycle's maximum output. In continuous shooting mode, the shutter lag and the frame rate are both altered for peak light output capture. In my tests above, the frame rate was reduced by 1-2 fps and shutter lag can be affected, making the camera feel slightly less responsive. The 7D II is able to work with light flicker occurring at 100Hz and 120Hz frequencies. When such flicker is detected but flicker mode is not enabled, a flashing Flicker! warning shows in the viewfinder. The FLICKER warning shows solid when a flicker is detected and the camera’s setting is enabled. Flicker detection has been working very well for me. From my own basement to an indoor sports venue to a trade show floor, I've seen the flashing "Flicker!" warning and enabling the Anti-Flicker mode has resulted in optimal image capture. Since the viewfinder's metering system is required for flicker detection, this feature is not available in Live View mode (due to the mirror being locked up). The mirror lockup feature is also disabled when Anti-flicker mode is enabled. The owner's manual indicates that Flicker mode is not going to work perfectly in all environments. In the test I shared above, flicker avoidance was perfect 100% of the time. I shot a soccer match at an indoor sporting venue with a complicated economy lighting system. In that shoot, the Anti-flicker mode was successful about 98% of the time in the about-350 images I captured. The post processing work required for this shoot was exponentially lighter than any of my many prior shoots at this venue. Sean's experience shooting an NCAA Division 1 football game under the lights was very good, but perhaps not as good as my 98% experience. Canon's new Anti-flicker mode is a game changer – it is going to save the day for some events. This feature alone is going to be worth the price of the camera for some photographers. Also enhanced is the 7D II's Auto minimum shutter speed with Auto ISO set. Previously, the default 1/(lens focal length) was used, not accounting for image stabilization and/or subject motion. New with the 7D II is the ability to dial in +/- 3 stops of shutter speed adjustment in full stop increments, allowing compensation for the current situation. 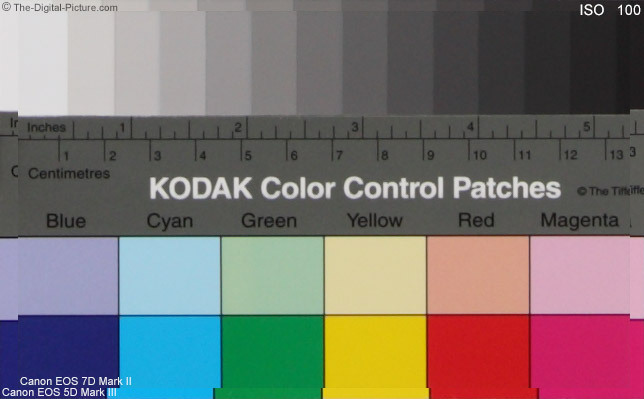 If the light on my scene is stable/unchanging, my camera is probably in manual mode with the settings I determine to be correct from the camera's histogram. If the light on my subjects is changing, such as under a partly-cloudy sky, I am probably relying on the camera's auto exposure system. As AE systems continue to advance, I am far more comfortable on this reliance and I frequently make use of AE in Manual exposure mode via the Auto ISO feature. I select the aperture and shutter speeds I need while the camera determines the final image brightness by adjusting the ISO setting. A great feature introduced to the 1D X via a firmware update and now present on the 7D II is exposure compensation in Manual exposure mode with Auto ISO. Two days before I wrote this section of the 7D II review, I was shooting a soccer match under a partly cloudy sky with deep shade in the background. I knew the shutter speed I needed to stop the action and I wanted a wide open aperture for maximum background blur. This meant using manual mode with auto ISO adjusting for the changing light conditions. The black background was causing my subject to be overexposed by nearly 1 stop in most cases. I was able to set manual mode exposure compensation to correct this issue. It is hard not to love the 7D II's new viewfinder. This large pentaprism viewfinder shows a best-available full 100% field of view at a 1.00x magnification. Those coming from a Rebel/**D or **D model are going to especially love the 7D II's big view on the world and will especially love not having to guess where the frame edges really are. As seen in the image above, this viewfinder, via the translucent LCD, can optionally be configured to show many framing and focusing aids along with a vast array of camera settings and warnings. While the full information view appears a bit overwhelming, not all information shown is displayed at the same time and the information shown is highly configurable with the basic view being an option. My 7D II viewfinder is configured to show only the active focus point(s)/area, the grid, the level indicator and the bottom right notices. I have long relied on viewfinder grid lines and have purchased many specialized focusing screens to get this feature in older Canon model DSLRs. Now, Canon's higher end cameras have grid lines optionally available via their translucent viewfinder LCD. The 7D II takes this feature one step further with lines that continue completely through the center of the viewfinder. I would like to see Canon improve the grid line feature even further by allowing horizontal grid lines to be placed on the often-great-for-composition 1/3 frame locations in addition to the 1/4 horizontal positions provided (the 1/6 vertical line positions include the 1/3 composition lines and a 3x3 grid is available in Live View mode). An analog exposure meter is now shown on right side and the display includes ambient compensation and flash compensation in effect. The 7D II is compatible with interchangeable focusing screens for a further customized setup. The currently available Canon 7D II focusing screen is the Eh-S Super Precision Matte focusing screen that aids in manual focusing of large aperture lenses. Another Canon DSLR feature that I've grown to rely on (and sorely miss when using a camera without the feature) is the electronic level. I struggle to keep the camera level and adjusting image rotation in post-processing is destructive at the pixel level. Not all images require a level camera and tilting can provide great effect for portraits, but landscape and architecture are two subjects that most often look best when photographed level. People are going to notice a tilted ocean on the horizon. Aligning a camera in low light or at night is a challenge that the electronic level completely removes. The 7D II has received the best electronic Level ever featured in an EOS body with the big improvement being the dedicated viewfinder dual-axis level LCD indicator accurate approximately from 1-4° for pitch and from 1-7.5° for roll. Canon's early electronic viewfinder implementations relied on AF points or the exposure scale at the bottom of the viewfinder to be used to show levelness. The problem is that these indicators reverted back to their primary purpose when the shutter release was half pressed. I am then required to maintain the camera's levelness as I focus, adjust framing and then shoot. To compensate, I often focus, switch to manual focus mode, frame, turn on the level indicator and then take the shot. I of course need to remember to turn AF back on before shooting the next scene. A dedicated viewfinder level indicator resolves this problem and the EOS 70D was the first Canon DSLR to provide this feature. The 7D II takes the dedicated viewfinder level indicator feature to another "level" by providing dual-axis indication with a more precise scale. With it's always-on (when metering is live), easy-to-see, dedicated, superimposed viewfinder level indicator, the EOS 7D II helps keep image level problems to a minimum. This feature is available during AI Servo full frame rate burst shooting, but using it during fast action capture requires another level of brain power. While this feature seems minor and insignificant, small improvements such as this can make a big difference in the quality of your images and can save many hours of work after a big shoot. A dual-axis level is also available on the rear LCD. In dim light, red LEDs light the viewfinder LCD display for easy visibility. These red LEDs can optionally be set to always be on or off using the menu. The 7D II, like the original 7D, has a larger-sized, more comfortable eyecup as found on the 1 and 5-Series models. These eyecups are larger than those found on the 70D and lower end models. Canon's 5-Series and 7-Series bodies are similar in size and only smaller than the 1-Series models. Add a battery grip and all of these models are similar in size. At first glance, the back of the 7D Mark II appears to have changed little from the 7D. The 7D II's button and switch layout remains largely unchanged, but some of the functions are different. 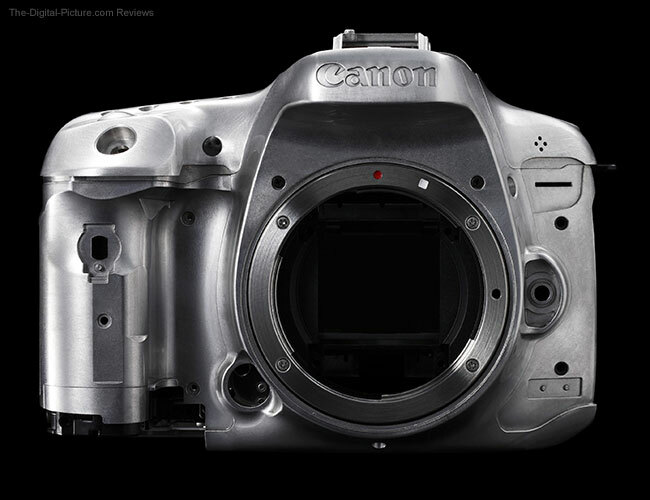 With even a long glance, you will see that the back of the 7D II appears nearly identical to the 5D Mark III. 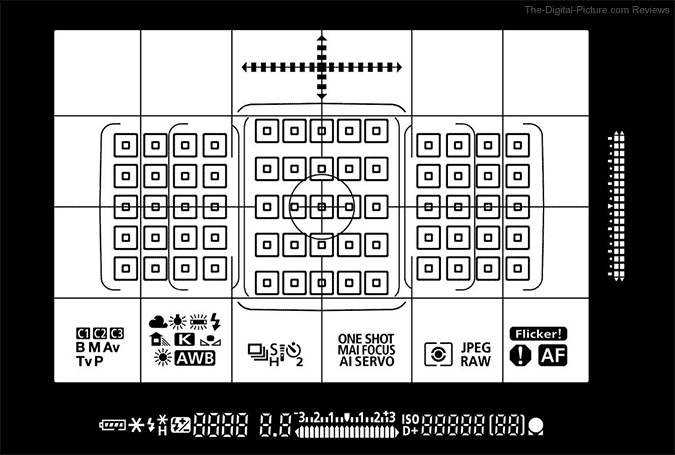 The two notable changes to the back right side of the 7D II are the addition of the "Q" button and the not-seen-before AF Area selection lever. The AF Area selection lever, surrounding the joystick, allows quick changing of, as you would expect, the AF Area selection. This lever is easy to find without taking the camera from your eye and is fast to use. Of initial concern to me was that this lever would impact use of the joystick it surrounds, but ... it does not affect joystick use. You can enable/disable the AF Area modes that are cycled through when using this lever. I suggest changing AF Area Selector Lever to direct select in the Custom Controls menu option (change the joystick to direct select while you are in that option). 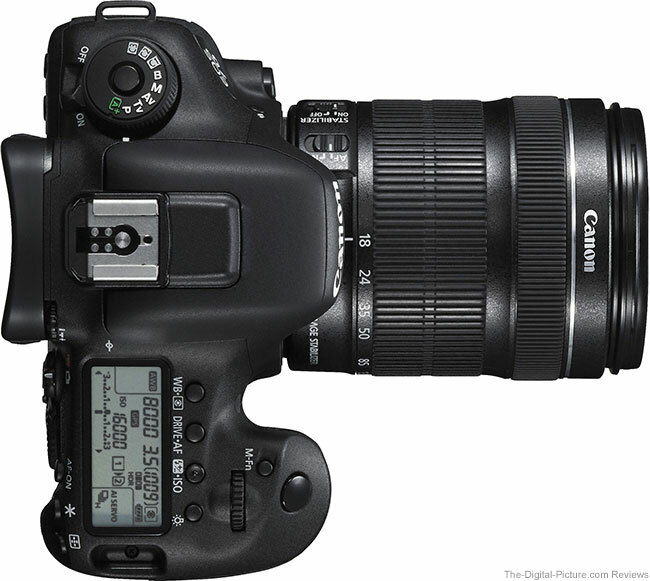 The "Q" button, as seen on most recent Canon DSLR cameras, has arrived on the 7D II. Pressing the Q button while in shooting mode will bring up the Quick Control Screen where camera settings can be accessed and adjusted quickly and easily without having to use the menu or look at the top LCD panel. Pressing the Q button while in playback mode will present an overlay with applicable options – including those for RAW processing. Brightness, White Balance, Picture Style, Auto Lighting Optimizer, High ISO NR, Image Quality, Color Space, Peripheral Illumination Correction, Distortion Correction, Chromatic Aberration Correction and the output dimensions and quality of the converted JPEG are selectable prior to processing. As we have seen recently featured on other models, a touchpad present within the Quick Control Dial can used for silently changing settings (only) while in video recording mode. No "click" of the dial is required – a simple touch of the sides of the dial will affect a change. Still, keeping the camera completely motionless through this process requires a strong tripod (or very steady hands with a soft touch). Though the back left-side buttons again appear similar to those on the 7D, more changes are present on this side. The 7D's info button has been replaced by the 7D II's magnifying glass button, while the top right two buttons, missing their blue "-" and "+", no longer zoom in and out during image playback (this removal is a mistake in my opinion). Zooming in and out is now accomplished by rolling the top dial after pressing the magnification button. This feature works fine, but I still often prefer to be able to press and hold the "+" button while zooming to 100%. This change brings the 7D II's zoom function in line with Canon's current pro DSLR models, but again, I'm not a big fan of this change. The 7D's Picture Style button becomes the 7D II's Rate button. I view this as a positive change as I never used the Picture Style button (I shoot using the Neutral Picture Style in-camera for a better/lower contrast histogram and change to Standard when processing the RAW files). Although I use a rating to mark a file or the start/end of a sequence of files occasionally, I do not rate images in-camera very often, so this button remains largely unused by me. Others love this button (including Sean, who uses it heavily), so make your own decision on the usefulness of this feature. Each press of the rate button adds a star (up to 5 stars) to the image. The rating is recognized even by non-Canon applications that include Adobe Photoshop Lightroom. The next button up is the Creative Photo button. Repeatedly pressing this button displays menus with Picture Style, Multiple exposure and HDR Mode selections available. The HDR mode is one that I find very useful. 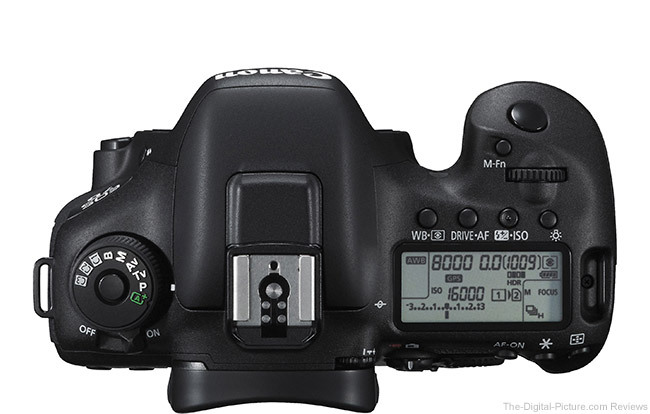 The 7D II's Menu and Info buttons have been moved up to the now-standard-for-Canon top left location. The menu button is one of my most-used and having it in this convenient-for-the-left-thumb, easy-to-find location is perfect. Being the first button to the left of the viewfinder makes the also-frequently-used (by me at least) info button easy for me to find. As usual, consuming the most space on the back of the camera is the LCD. With a full set of camera models introduced since Canon originally released the Vari-Angle LCD, it now becomes clear that the 70D is the highest model in the lineup to get this display. Canon's reason for not including the Vari-angle LCD on the 7D II is for build robustness – the Vari-angle LCD is a weaker design than the fixed LCD as implemented on the 7D II. Also notably missing is the capacitive touch feature that has also not yet moved up into the higher-end Canon DSLR model lines – again stopping at the 70D. The higher end cameras have more controls, and those using the higher end cameras often have more understanding of their camera settings and more familiarity of how to change them, placing less importance on the touch feature. 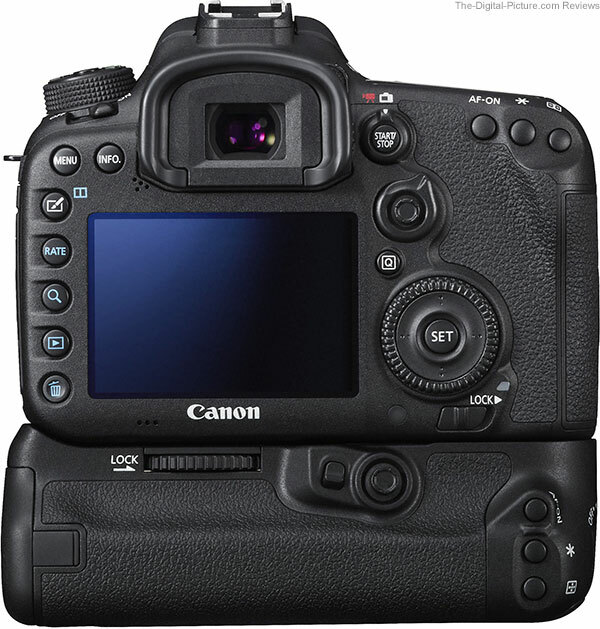 Again, the Canon-provided reason for not including the touch feature is build strength – the capacity touch LCD is not as robust as the LCD implemented in the 7D II. The 7D II, like the 5D III, receives the fixed, non-touch version of the Canon's best-at-review-time Clear View LCD II. Canon's Clear View II LCDs have no gap between the protective glass cover and the LCD unit, eliminating air-glass interface, reducing refraction and reflection, while the anti-reflective coating on the glass LCD cover further improves visibility of the display. The benefit is less glare, enhanced clarity (especially in a bright environment), better color and increased strength. I've used this LCD a very significant amount on the 5D Mark III and love it. The 7D II implementation is just as good. That I can clearly see the histogram even in direct sunlight is of critical importance to me and the 7D II covers this requirement. Canon's nicely-upgraded, very-easy-to-use tabbed menu layout, initially introduced with the 1D X, continues to make its way into all new EOS camera models and the 7D II is the latest to get this upgrade. The new, customization-option-laden 7D Mark II menu features multiple tabs, each with a number of submenus. Each submenu has a series of options and some of these options contain another level of sub-submenus. Press the Q button to jump from tab to tab and use the top dial to go from submenu to submenu. The Main Dial is used to navigate the menu options and the Set button is used to make a selection. New is that the My Menu feature (I use this extensively) has also been expanded to optionally allow 5 additional tabs of user selected menu options. My mind is still spinning with ideas for the new tabs, but ... I have not programmed a second tab as of review time. Overall, the back of the 7D II is very nicely upgraded and I absolutely LOVE that the 5D III and 7D II have so much similarity in their control and button layout. I very frequently am using multiple cameras at the same time. Being able to move from one body to another without having to figure out a new set of controls is a very positive feature. Next, we will take a look at the top of the camera. The top-of-the-camera differences between the 7D II and the 7D are not going to generate a very long conversation. A new bulge has appeared in front of the hot shoe (more about the GPS feature later), slight changes in body shape can be seen near the shutter release and the right-side button labels have been reversed. The other change is the addition of the now-standard center lock button on the mode dial, preventing inadvertent changes. Lacking the SCN (Special Scenes) and other creative modes, the Mode dial shows the enthusiast/pro orientation of this camera, including the presence of 3 custom-programmed modes (I use these modes very frequently). That said, complete beginners should find this camera very easy to use as well. Scene Intelligent Auto mode (the green square+ mode) combines point and shoot simplicity with powerful artificial intelligence to deliver excellent results. "... Scene Intelligent Auto mode analyzes the image, accounting for faces, colors, brightness, moving objects, contrast, even whether the camera is handheld or on a tripod, and then chooses the exposure and enhancements that bring out the best in any scene or situation." [Canon] The 7D II also implements the new light flicker avoidance capability in this mode when such is detected. The following Canon graphic provides a glimpse into the Scene Intelligent Auto mode as implemented on the 7D II. These icons are shown in Live View mode when Auto mode is in use. Once again, the top of the 7D II is nearly identical to the top of the 5D III. Canon's great ergonomics are just one of the many reasons I use Canon brand cameras in the first place. That the 7D II does not depart significantly from other recent body designs is a positive feature. Here is a look at the left side of the 7D II along with a collection of other recent Canon EOS models to compare with. The following image shows the 7D II's port covers open for a better look at the connectivity options provided by this camera. Starting at the top-right, we find a USB port. While Canon cameras have long had USB ports, the big news is that the 7D II, FINALLY, gets a USB 3.0 port. The USB 3.0 standard is MUCH faster than USB 2. If you have ever downloaded a large number of images from an EOS camera using the USB port prior to this one, you know the definition of slow. 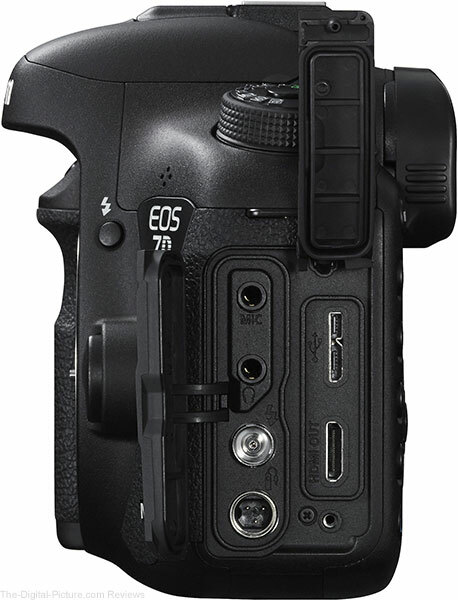 The 7D II's USB port allows fast image downloads and also faster control from a computer such as when using EOS Utility to control camera functions. This upgrade to any EOS camera is long overdue. Below the USB port is the HDMI mini port (Type C, HDMICEC compatible). While this port has become common on EOS DSLRs, output of uncompressed YCbCr 4:2:2, 8-bit for video streaming is newly possible. Also new is that sound can be output via HDMI. At the top-left is the external microphone port (3.5mm Stereo mini jack) and next-below is a headphone jack. Next down is a PC Port (commonly used with studio lighting) and an N3 type port (for a remote controller) rounds out the available ports. Note that the N3 port is used on higher-end 1-digit series Canon DSLRs, while the E3 port is used on the **D/Rebel/***D lines. As mentioned, the 7D Mark II's size remains similar to the original 7D's size. This size is also a near-match to the 5-Series bodies. The table below shows the specifications. The 7D II is a high-quality, solidly-built, modestly-sized DSLR camera that feels very comfortable in my hand. This camera is large enough to provide adequate control over the larger professional-grade lenses – a super telephoto lens is not too large to comfortably mount on this camera. That the Canon EOS 7D Mark II qualifies for points toward membership in Canon Professional Services (in regions available) shows Canon's perspective on the performance level of this camera. This camera is designed for professional use, starting with the magnesium alloy chassis it is built upon. Professionals need to get the job done, regardless of the working conditions and weather often plays a role in such. According to Chuck Westfall (Canon USA), "Canon considers the weather resistance of the EOS 7D [version I] to be slightly better than the EOS 5D Mark II and 50D cameras, but not as robust as the EOS-1D series." The EOS 70D received similar weather sealing. Mr. Westfall describes the EOS 7D Mark II weather sealing as 4x better than the 7D. While "4x" is a hard figure to qualify, sufficient is to know that this camera is a much better choice in wet and dusty conditions than the original 7D or the 70D. Roger Cicala, in a 7D II tear-down, verified that the improvements are significant. Canon told me that the 1D X remains a better-sealed camera, but ... there does not seem to be much room for improvement over the 7D II's level of weather sealing. While no one is going to guarantee how long your DSLR will last, a higher shutter durability rating is certainly a positive attribute. Increase the frame rate and shutter life becomes a bigger issue. The 7D II's 50,000 shutter actuation rating increase over the 7D's 150,000 spec will more than cover the % increase in frame rate. The 7D Mark II becomes Canon's highest-end camera model to receive a GPS receiver in-camera (the aforementioned bulge in front of the hot shoe houses the antenna). The built-in GPS receiver with a digital compass can record location information including longitude, latitude, elevation and time (UTC) to an image's EXIF information. The 7D II can provide geotag information logs to trace the route the camera has traveled in addition to recording image capture locations. A feature I love is that the camera's time can be automatically set from the GPS signals. Have you seen one of the TV shows filmed with a DSLR camera? One of the easiest ways to tell is by an imaging sensor dust spot showing against the sky or other evenly-light-colored surface. Sensor dust is one of the easiest ways to turn a high quality video clip into something low end. The sensor has to stay clean. While still images are more-easily touched up, sensor dust can cause time consuming post processing that I find frustrating and not a good use of my time. Canon has been making advances in self-cleaning sensor technology over the years and I'm seeing the 5D III's truly amazing level of performance repeated by the 7D II. I rarely have to clean my 7D II sensor and when I do, a Rocket Blower is usually all that I need. The benefit I have received from the sensor sensor staying clean amounts to at least days and probably weeks of my life. With several thousand shutter actuations and many lens changes, I do not even have a single tiny speck of dust showing on the sensor. That is a great start. Especially noticeable when panning through an image hunting for specs of dust is that everything this camera does is fast. I can pan through an entire zoomed image very quickly. In Dec 2013, I posted a "What I Want for Christmas from Canon" list. Canon has been whittling down my list throughout 2014. Earlier this year, with DPP 4.0, an attempt was made to deliver the "Canon Digital Photo Professional (DPP) Improvements" and the Canon EF 16-35mm f/4L IS USM Lens effectively took down the "Canon EF 16-50mm f/5.6L IS USM Lens" line item. With the EOS 7D Mark II, three more line items have been addressed. I already talked about "Exposure Compensation in M mode with Auto ISO" and the "Viewfinder Electronic Level that Remains Available During AF". The third line item that is now crossed off comes from the why-wasn't-it-always-there department, the "Built-in Intervalometer". The 7D II has built-in Intervalometer (interval timer) and bulb timer functionality. While many of us are questioning why 99 is the upper limit for the number of images that can be captured in a series (a potentially short time lapse), that an unlimited number of images can also be captured by setting the number of images to 00 greatly reduces this issue. Interval timer shooting can be combined with AEB, WB bracketing, multiple exposures and HDR mode, but Live View shooting, bulb exposures and mirror lockup are not supported. I would like to see mirror lockup with a 2 second self-timer implemented. The 7-D series cameras remain Canon's highest EOS model line to offer a built-in pop-up flash. As with all of Canon's other recent DSLR cameras, flash settings can be controlled from the menu which includes an extensive range of controls for built in, hot-shoe-mounted and remote flashes. Simply double-press the camera's flash button (or single press the flash button with an external Speedlite mounted) for instant access to the Flash Function Setting Screen. The 7D II is also fully compatible with Canon's incredible RF remote flash system including the Canon Speedlite 600EX-RT Flash and Canon ST-E3-RT Speedlite Transmitter. Like the 70D and most of Canon's other recent DSLR cameras featuring a built-in flash, the 7D II includes an Integrated Speedlite Transmitter for optical (not RF) wireless control of multiple off-camera EOS Speedlites. No 600EX-RT, Canon 580EX II Flash, Canon ST-E2 Speedlite Transmitter or similar accessory master flash is needed to completely control as many remote flashes as desired. Using one of 4 available channels, take complete control of up to 3 groups of flashes (A,B and C) with ratios of up to 8:1 including ±3 stops FEC. Having a built-in Speedlight Transmitter is a big deal. It not only saves a significant cost associated with the other Speedlight Transmitter options, but it reduces the size and weight of the camera when using remote flashes. The Integrated Speedlite Transmitter feature alone, if needed, will save you the purchase of a device with a significant cost – and the convenience factor of having this feature built-in is huge. But the best part is the image quality that off camera flash delivers. I was disappointed when I read that the 7D II was featuring a new battery model. 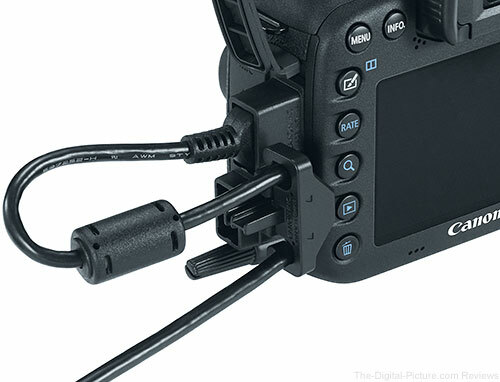 The previously-featured Canon LP-E6 lithium ion battery pack has been used in many DSLR models and I greatly appreciate the simplicity of being able to share batteries and chargers. Fortunately, the LP-E6 and the new LP-E6N lithium ion battery packs are both forward and backward compatible including compatibility with the same LC-E6 and LC-E6E chargers. The advantage of the new LP-E6N? An increase in storage capacity from 1800 mAh to 1865 mAh. Note that the 7D II owner's manual states that "The [LC-E6] charger cannot charge any battery other than Battery Pack LP-E6N/LP-E6", meaning that third party batteries may require a third party charger. The LP-E6N battery form factor is great (you can easily fit several of these small batteries in most pockets), but they still provide a rating of up to 800 shots in the Canon EOS 7D Mark II. Battery life is always highly variable based on factors such as drive mode, flash use, live view/video use, GPS logging and temperature. Shoot in the high frame rate drive mode and you can expect to far exceed the factory rating. Shoot with 100% flash output while using live view in below-freezing temperatures and the 800 shot rating will appear to be a fantasy. My first and second full LP-E6N charges provided 1,347 and 1,173 shots respectively with 18% and 21% battery life remaining for an estimated 1,464 and 1,448 shot total capacity. My camera use was very mixed during this time, with Live View and burst mode being favored most heavily. The 7D II provides a 6 level battery indicator on the top LCD and a specific percent remaining value in the Battery Information menu. This menu also provides a shutter count and a recharge performance rating for the installed battery. Need twice as much battery capacity? 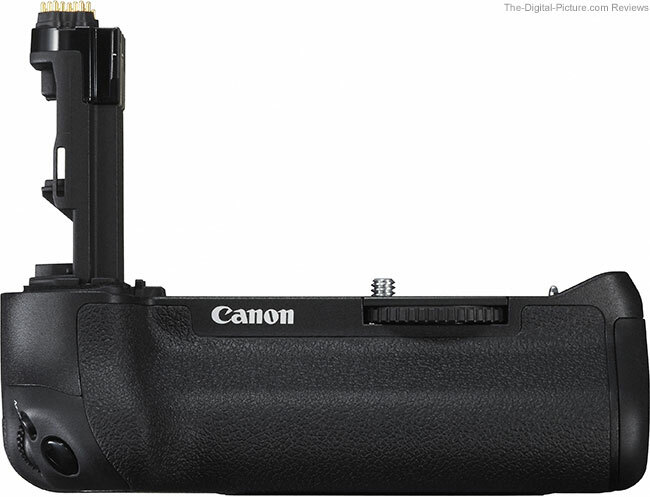 Optional for the 7D Mark II is the Canon BG-E16 Battery Grip (shown installed above). The battery grip accepts two LP-E6 or LP-E6N batteries (or optionally 6x AA batteries), doubling the shot-per-charge capacity of this camera. Better yet is the vertical grip that the BG-E16 provides. Like the 5D Mark III's BG-E11, the BG-E16 includes a vertical grip-dedicated joystick. Unlike any battery grip before it, the BG-E16 has an AF area selector lever. The downside to using the battery grip is the additional size and weight, but with the grip being easily removable, you can choose the best option for your current circumstances. Sean suggested that I pass on a word of warning: "Once you try shooting with a battery pack, you may never want to shoot without it." Here is one more look at the back of the 7D II with the BG-E16 battery grip installed. I say it in each Canon EOS DSLR review, but the statement remains timeless. When you buy a Canon DSLR, you are buying into an incredible family of lenses, flashes and other accessories. The camera body (or multiple bodies as is more frequently the case today) is the base your system is built on and a lens is the next essential piece of kit. The Canon EOS 7D Mark II is available as a body-only or in a kit with the Canon EF-S 18-135mm f/3.5-5.6 IS STM Lens. This lens, shown mounted on many of the product images on this page, is a good value with a long focal length range and good support for video recording. DSLR camera image quality is only as good as the weakest link in the imaging system and the weakest link is often the lens. The quality of the lens makes a big difference in the image quality realized by any camera. Review the Canon general purpose lens recommendations page to find the most up-to-date list of best lens options. Then add, minimally, a telephoto zoom lens and a wide angle zoom lens to your kit. The Canon EOS 7D Mark II is compatible with the small, inexpensive Canon wireless remotes including the Canon RC-6 Wireless Remote. Want to be part of your own family picture? Or just don't want to deal with a remote release cord? This is the accessory you want. The 7D II is also compatible with Canon's N3 wired remotes including the Canon Timer Remote Controller TC-80N3 and Canon Remote Switch RS-80N3. Want more-complete remote control of your 7D II? Add the Wireless File Transmitter WFT-E7A Version 2 as shown below. The WFT-E7A mounts under the camera and plugs into the side port. Note that WIFI was not featured on the Canon EOS 7D Mark II primarily due to the metal body construction's incompatibility with this technology, but Eye-Fi cards are supported. Browse the reviews section of the site to find many more compatible accessories including flash systems, tripods & heads, cases, additional batteries and much more. When compared to Canon's other APS-C DSLRs, the 7D II has a very high price tag. But with the features and capabilities of this camera, the 7D II is a bargain compared to cameras such as the 5D III and especially the 1D X. I expect that this camera's great features-to-price ratio is going to drive a huge sales volume and initial sales are supporting this expectation. Those not able to afford the 1D X but needing high performance AF and high speed frame rates are going to find the 7D II the perfect option. Keeping a review of the incredibly-feature-laden 7D II concise but complete is a difficult balance to find and this review is not a complete description of every 7D II feature available. Canon has published an intimidatingly-huge 548 page owner's manual (a link to the manual is be provided with this review) that highlights all of the features found on this camera and explains their use. The manual tells you all about a huge array of features including Auto Lighting Optimizer, Distortion Correction, Chromatic Aberration Correction, Peripheral Illumination Correction, remote control via a USB-connected computer, flash setup and control, High ISO Noise Reduction, Long Exposure Noise Reduction, Highlight Tone Priority, HDR, Multiple Exposure ... and many, many other topics. Read the manual, go use your camera, repeat. Owning a Canon product gives you access to Canon support and the support provided by Canon's USA division is excellent (sorry, I have no experience with the other Canon divisions). When I call for support, I get an intelligent person who sincerely wants to help me with whatever my question or problem is. Canon repair service, though I seldom need it, is fast and reliable. Those residing the USA with a 7D II in their kit along with a nice lens or two will qualify Canon CPS membership and the additional support benefits this membership provides. 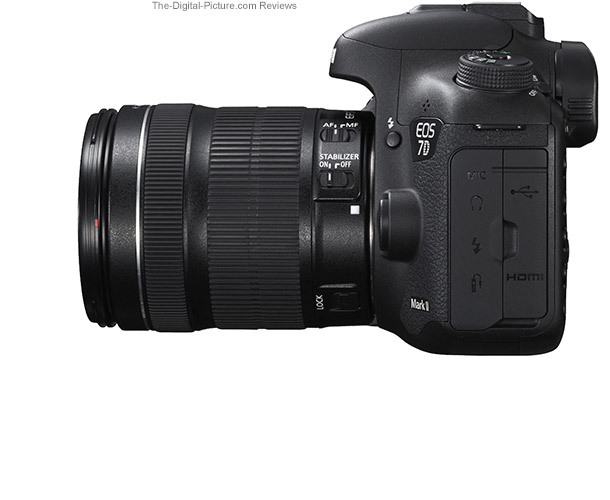 The 7D II used for this review was ordered online/retail. Is the EOS 7D II the right camera for you? The answer to this question is going to be yes for a considerable volume of people. For someone considering the EOS 7D II purchase, the other current EOS models that should be considered include the EOS 70D, EOS 5D Mark III and EOS 1D X. The 7D II's noticeably higher price ($600.00 USD at review time) is going to push many casual photographers to choose the 70D. Those looking for a small and/or less-expensive model should also consider at this time the Canon EOS Rebel T5i and the Canon EOS Rebel SL1. These two cameras give up little in image quality, but do give up features and performance. 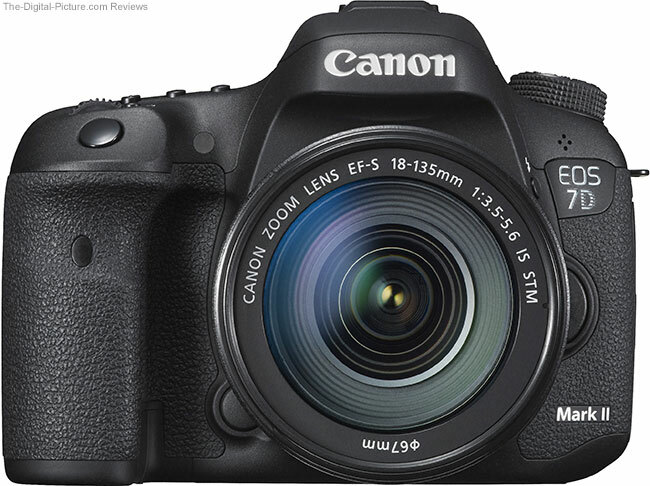 Those looking for the ultimate pro sports/action camera are going to choose the Canon EOS-1D X. Here is the Canon EOS 7D II vs. 1D X specification comparison. Price is the easy 7D II advantage, but Dual Pixel CMOS AF and built-in GPS are among the additional 7D II advantages. While the Canon EOS 5D Mark III will compete against the 7D II for a place in some kits, these two cameras will also make excellent kit partners. The 5D III, with its higher resolution full frame sensor, has better image quality – especially in low light. The 5D III's frame rate is rather slow for sports/action photography and for someone not specializing in photographing these events, it could make sense to pull out a 7D II for situations needing speed. Here is the Canon EOS 7D II vs. 5D Mark III specification comparison. I expected that the 7D II would be greeted with high demand (and it was), but that prediction was not hard to make. "Building on the class-leading performance of the iconic EOS 7D, and harnessing technologies found in the flagship, professional EOS-1D X ..." [Canon UK], the Canon EOS 7D Mark II is assured of ready acceptance by enthusiast and professional photographers. My 70D is on the porch waiting for the brown truck as I write this. I sold it to B&H Photo's Used Department to help fund the 7D II acquisition. Many 7D II features combined to sell me on this upgrade, but standing out to me were the new AF system and the 1D X and 5D Mark III-similar controls. Holding a 7D II is indeed like having a baby 1D X in your hand. 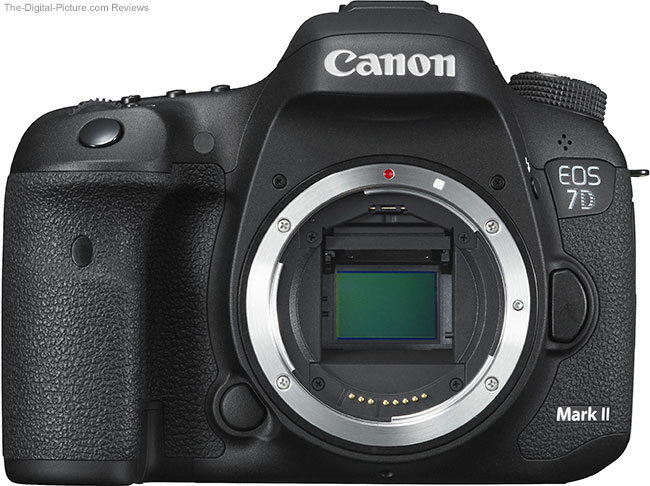 The 7D Mark II leaves no doubt about its rule of the Canon APS-C sensor lineup. With an advanced and extremely capable AF system, fast burst rate, Dual Pixel AF and customizable Movie Servo AF, the EOS 7D Mark II is going to find its way into a wide range of photographers’ kits where its use will be either as a primary camera or secondary to an EOS 5D Mark III or 6D. Its speed-oriented feature set is especially well-suited for wildlife and sports action photography, yet anyone wanting to step up from an ***D/Rebel or **D series camera should seriously consider the 7D Mark II because of its great versatility, solid ruggedness and excellent value.